There is something to be said for enjoying the simple pleasures of life while cruising. The vistas, sunrises, sunsets and the splash of bait being chased through the anchorage by something bigger and hungry for the taste of fish. There is something about the latter that gets the little boy inside of me jumping up and down with anticipation of jumping into the dinghy and racing to the location of the boiling bait and fish. Fishing is a source of providing fresh fish onboard Dazzler. There is something really awesome about having truly fresh fish whether it’s sashimi, grilled fresh fish tacos, or any other fresh fish preparation. 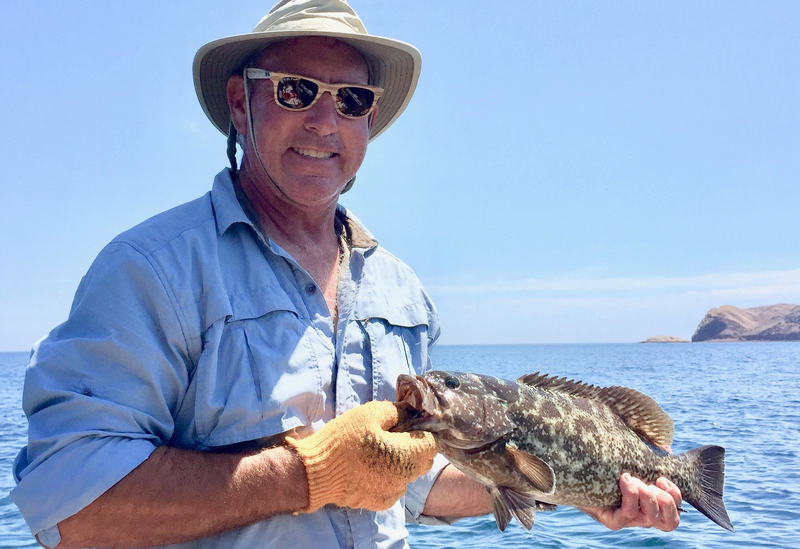 I have been fishing most of my life and when presented with the natural environment of the Pacific Ocean and the Sea of Cortez, it’s like jumping up and down until you can grab your fishing equipment and hit the trail on your trusty steed. In my case it is Sparkle. That seams a little weird, but Pontoon Stud was already taken. I guess I should back up a little and discuss what kind of fishing gear would be useful for putting fresh fish in your cooler. There are so many different types of rods and reels available for the angler and all at varying cost points. My recommendation is to use something that can handle fish in the five to 30 pound range. Something smaller will work a few times but it will eventually cave in. The line you use is important also. I would suggest that you consider spending a few extra coins for some kind of upgraded line. I will leave your choices up to you. I use 30 and 40 pound test Spectra line with a 12-15 foot Fluorocarbon 20 or 30 pound test leader. Be sure to teach yourself how to tie the dissimilar lines together. Spectra line is very slippery and the knot used to join the leader should be one that doesn’t let the Spectra line slip out of the leader. There are many sources on the Internet to get examples of the proper knot and I don’t want to suggest that I’m an expert. I always suggest that you practice and test. Additionally, the knot you secure your hook or lure to the leader with should be equally strong. Many fishing suppliers usually have a knot book near the front counters. Some line manufacturers will sometimes include some knot tying guides in the line box. There is no competition between live bait and lures. Live bait would be my first choice but out here there are not many bait stores to sell you a scoop of live bait. So, you have to catch it yourself or jig for it or use a cast net for it. Then you will need some kind of bait receiver that will keep your bait alive. It can be as simple or elaborate as you want. A Home Depot bucket with a lid on it and numerous holes, smaller than the bait, will work. I suggest you use two buckets. The second bucket would be without holes for the first bucket to set into. This will allow you to change out the water regularly without losing your bait. Which you must do or your bait will die from lack of oxygen. You could always buy an aerator so you don’t have to change the water out. Don’t overcrowd the bucket with bait either. That will also result in bait dying off due to competition for the limited fresh oxygen in the water for all your bait. As you can see there are some difficulties and high maintenance with the fresh bait scenario. My choice is to use lures that closely resemble the natural bait found in the area you plan to fish. Rapala Floating Silver Mackerel Diving and Shallow Diving Lures. I prefer to use lures because my confidence level in catching fish with them is very high. Even when my freezer is full of fish, I still go out and fish. If you want to be good at something you practice it. I look at catch and release as a form of practicing. The more you practice the better you become at every aspect of what you practice and your confidence level increases as well. Casting, target casting, short casting, straight retrieval, varied retrieval, etc… Presenting a lure directly in front of a fish followed by an explosive strike is a rush. Trolling your lure at different speeds for the type of lure you are presenting and where to cast or troll your lure is just as important. Being on the water in a small boat and taking in the different forms of wildlife is by far the biggest aspect of being out fishing. I have seen huge schools of rays leaping out of the water all around my dinghy. Watching dorado push a school of bait fish toward the shore and then feast like kings on the less fortunate bait is awesome to watch. Nature doing what it does is incredible. If you aren’t out there to enjoy it, you miss it! Another aspect of fishing from the dinghy is it provides you with a closer look at submerged rock and reefs around your anchorage. There are many areas that I have found to be productive in the sense of catching. Yes, I said catching. Fishing is the act of using a rod and reel or hand line. Catching is the fight between you and the fish until it yields, shakes lose, is eaten by a bigger fish or breaks your line and steals your lure. Around anchorages in the Sea of Cortez there are many submerged rocks, rocky shorelines, points, sandy beach areas and other underwater structures. Predator fish such as yellowtail, dorado, tuna, wahoo and rooster fish will hang around underwater structures or patches of shade on the water’s surface to hide and ambush unsuspecting bait fish. They lay in wait so to speak. If you can identify these types of areas to troll your lure through or cast into, your success rate for catching will increase. There are several areas this past summer that Jilly and I have gone dingy fishing and caught numerous fish such as Cabrilla, yellowtail, sierra, dorado and others. While anchored in Refugio at the north end of Angel de La Guarda, we went dinghy fishing and in two hours we had caught and released about 30 Cabrilla, one yellowtail and a few trigger fish. I even caught two trigger fish with one cast. One was hooked to the front treble and the other to the back one! What a fun day of catching on the water together. In another anchorage in the Midriff Islands on two separate occasions we went out dinghy fishing. The first time we caught and released about 28 Cabrilla, including two six pound Cabrilla within a few minutes of each other. On our second trip there, we caught and released 16, 4-9 pound yellowtail within a two hour period. We did keep six yellowtail for dinner and the freezer. If you don’t want to take fishing that seriously then don’t. But, if you want to be successful at catching then you need to put in rail time. Just like any other talent. Practice is the key to success. Because weather influences everything, it is noteworthy to discuss its influence on fishing. Tides, currents and falling barometric pressure can all have an influence on your catching success. If you are in an anchorage and the bar is falling off normal, grab your gear and start fishing. This is much like freshwater bass fishermen do when the bar falls near a fresh water lake. The fish can sense the change in pressure and it has been my experience that the falling bar will induce them to strike more as if they are trying to store up some excess food prior to the possible change in weather. That’s it from the deck of Sparkle. I wish you all great fishing success in paradise. Next post: What Is “The Good Life”?